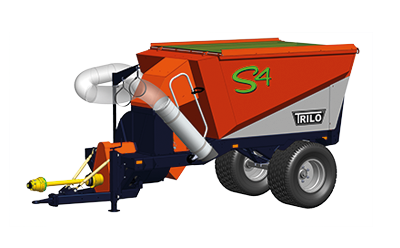 For removal of leaves or litter from hard-to-reach places. Medium-sized vacuum sweepers equipped with a wander hose are ideally suited for mobile removal of litter from hard to reach places. Because these vacuum sweepers are compact, they are perfectly usable at, for example, camping sites, event sites or city parks. The compact vacuum sweepers are equipped with a 6 metres long flexible suction hose with a diameter of 250 mm. The end piece is equipped with a comfortable hand grip, a gauge wheel and a rubber end piece that allows collecting large amounts of material quickly and effectively. The fan is driven by a PTO drive shaft attached to the tractor and requires an output of The required hp PTO can vary depending on the working conditions.45 – 70 HP (33 – 51 kW). • Quickly clear large amounts of litter. • Compact and very manoeuverable.